Musica mourning the loss of her sisters. New! Reebok Stompers from Aliens Announced! Hey there! 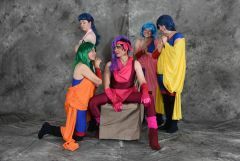 Are there any Macross fans heading to Fanime 2016 in Sanjose California this May? 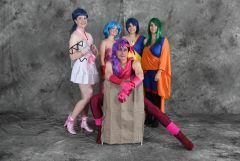 I was looking to start a Macross cosplay gathering if anyone is interested? More information of the fanime boards here http://forums.fanime.com/index.php/topic,20339.msg487424.html#msg487424 Let me know if you're interested and I'll put you on the list! At Japan Expo in Santa Clara, I took an experimental photo with Lina Lau, which yielded this: CG composite of a Macross VF-25 with Sheryl Nome. (click the picture for a larger version) If anyone is curious, there's some detail on how I did it on my LJ. TL;DR: I used Blender's compositor & Cycles renderer with a lightprobe I created in Hugin from a series or mirrorball images. (the red parts glowing is me trying to make it more obvious in a dark scene) VF-25 model is from a library of free Sketchup models. I think it came out kinda cool, but also not quite as epic as I hoped. So I think I'll try it again. Probably next time with one of Sirian's Sheryls. (probably not the one linked there) I was wondering: Does anyone here have any higher detail (and perhaps more Blender-friendly) 3D models of any of the variable fighters from Macross Frontier that you might be willing to volunteer for use in cosplay photos? My modeling skills are not horrible, but available time to make my own is in short supply. I'd like to try my hand at making this costume, but I may be in over my head. I have no experience with engineering or sculpting, but I think the idea is sound. I'm just unsure of how difficult it would be, not to mention how expensive, to make such large pieces. And what is the best material to work with? Resin? Fiberglass? Any advice?